What's the key to amazing tamales? Tina "Tamale" Ramos reveals her trick to making her food taste so good. Chef Ryan Scott explores Oakland, California, a city with a thriving, diverse restaurant scene. Ryan has a list of places he wants to check out. His first endeavor is tracking down a couple of popular food trucks in the area. First he visits a truck named after Oakland's area code, fivetenburger. It's known for its burgers and garlic fries. Ryan takes a bite of one of Roland Robles' famous burgers and loves it. "So good! Dude, the pickles are amazing," he says. Ryan is always in search of a good pizza especially if there is a fun spin on the classic pie. So for his next stop he pays a visit to James Whitehead, the owner of Fist of Flour Pizza Company. James likes to make wood-fired gourmet pizzas. He's mobile too. He mounted a pizza oven to a trailer so he can travel anywhere with his creations. James shows Ryan how to toss pizza dough, but Ryan might need a little more practice. When it comes time to adding toppings, James thinks out of the box. He adds blueberries! The end result is wonderful, and Ryan loves it. 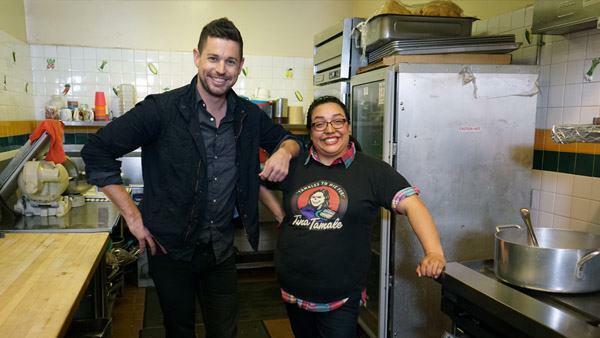 Ryan can't go to Oakland and not visit his good friend Tina "Tamale" Ramos, so he drops by La Borinque�a Mexicatessen which Tina's grandmother started as the family business in 1944. So what makes Tina's food taste so good? She says her secret ingredient is lard. She takes Ryan into her kitchen and shows him how she preps it. Tina likes to say "made with love and lard in Oakland." Ryan is intrigued by a place called Souley Vegan, home to the only vegan soul food in the country. Executive chef and owner Tamearra Dyson's Louisiana-inspired food comes from her family background. Her mom introduced her to the mix of vegan and soul food. She believed in the benefits of a meatless diet, but at the same time made Tamearra's grandfather's favorite Southern-style food, full of butter and saturated animal fats. Tamearra brings the two together, making vegan soul food! Tamearra shows Ryan how to make a Southern Fried Tofu bowl. She brings in the Southern flavor with okra and grits. But with vegan restrictions, Ryan wonders how the grits will taste. "How do you make grits taste good with no butter, no fat, no cream?" he asks. Tamearra says they do use a little vegan butter. After learning how she cooks up this signature dish, Ryan tries the grits. Ryan wraps up his Oakland adventure with a stop at a new restaurant in Oakland called The Cook and her Farmer. He learns how to shuck oysters. The oysters are locally sourced, and the restaurant prides itself on fresh and local ingredients. "You know what I noticed about Oakland? Everything is made with love," says Ryan. For more from FiveTenBurger, visit FiveTenBurger.com. For more from La Borinquena Mex-icatessen and Specialty Shop, visit TamaleGirl.com. For more from Souley Vegan, visit SouleyVegan.com. For more from The Cook and Her Farmer, visit TheCookAndHerFarmer.com. Here's a twist on a classic dish - blueberry pizza! What do you get when you mix Southern comfort food and vegan ingredients? Souley Vegan! It's a local hot spot for foodies who love the Southern taste but want healthier options. Ryan learns how to prepare Oakland's best oysters.